I’ve seen more than a few spectacular failures when trying to apply modern technology to acre-level yield predictions and agronomic recommendations. There’s never been more interest in “AgTech” but I remain a skeptic that remote sensing/algorithms/etc can accurately track and account for all of the micro-variables that go into producing your crop. Most farmers agree with that stance, but I’ve seen some amazing looking marketing material that can sway even the most skeptical (myself). A few years ago I had a meeting with a representative selling a weather insurance product. This guy gave me one heck of a good sales pitch. You could insure against nearly all of the individual weather components that drive a crop yield. Risk of it being too hot? They have you covered! Risk of an early frost? They have you covered! Risk of no rain? They have you covered! Too much rain/late planting? They have you covered! I have to say, I was quite impressed. This guy pushed very hard to come up and have me introduce him to a bunch of local farmers. To their credit, they were very transparent with past performance. Given a challenging recent growing season, I wanted to take a look at this past performance before making any introductions. In June of the preceding growing season, we got pounded with rain. Some areas received 20"+ of rain. As you know, rain isn’t always a good thing. I knew of 3-4 areas where local farmers had had a yield of 50% of average. I logged into the weather insurance portal to check the payouts from these areas. To my surprise…..the payouts were $0 for all the areas I checked. If producers had this weather insurance, they would’ve had to pay approximately $50/acre in premium on top of $100+/acre losses!! OUCH! I don’t blame the company that built the insurance, these are difficult problems to solve. 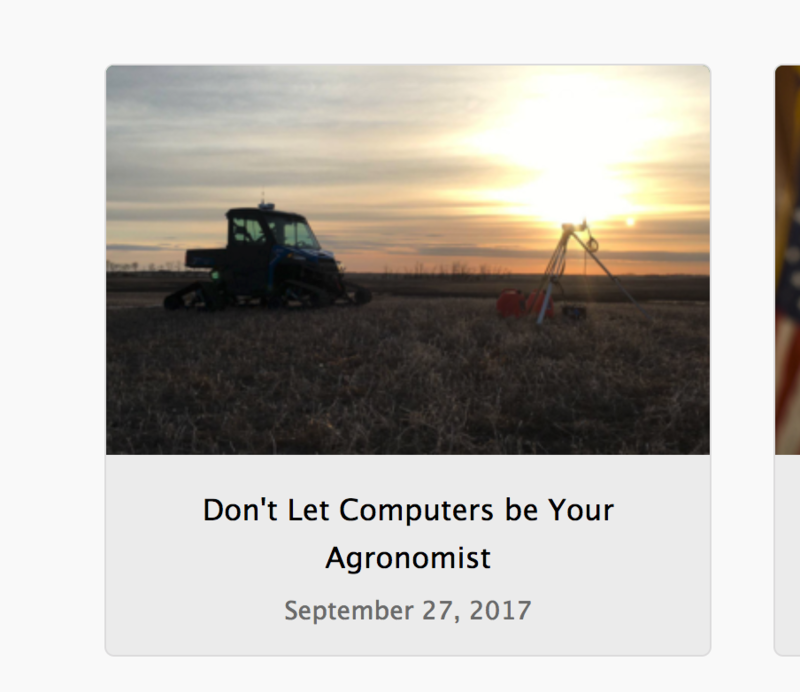 Well, actually, their marketing was a bit sketchy and definitely didn’t focus on the potential “weather basis” as I called it…..the difference between the computer-predicted yield impacts and the actual yields. I’ve also seen a number of algorithm-generated nitrogen recommendations more recently that were incredibly “off” when compared to tissue tests. There are companies out there with a lot of funding and very good marketing. If a service doesn’t offer extensive ground truthing, consider me very skeptical. While I’m not an agronomist, it makes sense to me to let your ground (via soil tests/maps/HD satellite imagery) and plants (via tissue tests) tell you what you need to do on your farm. These ground-truthing activities combined the power of a human brain are hard to beat in my opinion. Technology is great….I just don’t trust a black box (especially at $5-10+/acre). The good thing is that most of you share my skepticism, which I think is warranted! Use precision ag technology has an aid in your success not a crutch. If you’d like to sign up for our free e-mail newsletter to be the first to receive content like this, enter your email below.